The number of individuals participating in athletic activities is continually increasing, whether these individuals are highly competitive athletes or weekend sports enthusiasts. 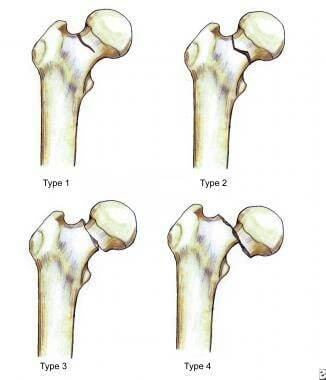 [1, 2] Stress fractures of the femoral neck are uncommon injuries (see image depicted below). In general, these injuries occur in 2 distinct populations, (1) young, active individuals with unaccustomed strenuous activity or changes in activity, such as runners or endurance athletes, and (2) elderly individuals with osteoporosis. Elderly individuals may also sustain femoral neck stress fractures; however, hip fractures are much more common and are often devastating injuries. Classification of femoral neck stress fractures. Femoral neck fractures in young patients are usually caused by high-energy trauma. These fractures are often associated with multiple injuries and high rates of avascular necrosis and nonunion. Results of this injury depend on (1) the extent of injury (ie, amount of displacement, amount of comminution, whether circulation has been disturbed), (2) the adequacy of the reduction, and (3) the adequacy of fixation. Recognition of the disabling complications of femoral neck fractures requires meticulous attention to detail in their management. Stress fractures of the femoral neck are uncommon, but they may have serious consequences. Markey reported that femoral neck fractures comprise 5-10% of all stress fractures. Certain groups of athletes, including long-distance runners who suddenly change or add activities, appear to have a higher prevalence of femoral neck stress fractures compared with the general population. Plancher and Donshik reported a prevalence rate of at least 10% for ipsilateral femoral shaft fractures, of which 30% are missed on the initial presentation. Brukner reported that women have a higher rate of stress fractures than men, with relative risks ranging from 1.2 to 10 for similar training volumes. Training errors are the most common risk factors, including a sudden increase in the quantity or intensity of training and the introduction of a new activity. Prevention of osteoporosis is key to reducing these numbers, as osteoporosis remains the single most important contributing factor to hip fractures. The prevalence of hip fractures, regardless of location, is highest among white women, followed by white men, black women, and black men. Koval and Zuckerman noted the age-adjusted incidence of femoral neck fractures in the United States is 63.3 cases per 100,000 person-years for women and 27.7 cases per 100,000 person-years for men. Femoral neck fractures in elderly patients occur most commonly after minor falls or twisting injuries, and they are more common in women. In addition, Joshi et al noted stress fractures of the ipsilateral femoral neck as a rare consequence of total knee arthroplasty. Influencing factors are correction of a significant knee deformity and inactivity before the total knee arthroplasty. The exact incidence of femoral neck stress fractures is not known. Volpin et al reported a rate of 4.7% in 194 Israeli military recruits. Zahger et al reported a higher rate of femoral neck stress fractures in Israeli female military recruits. Insufficiency fractures are more common in females secondary to osteoporosis. The femoral aspect of the hip is made up of the femoral head with its articular cartilage and the femoral neck, which connects the head to the shaft in the region of the lesser and greater trochanters. The synovial membrane incorporates the entire femoral head and the anterior neck, but only the proximal half of the posterior neck. The shape and size of the femoral neck vary widely. Crock standardized the nomenclature of the vessels around the base of the femoral neck. The blood supply to the proximal end of the femur is divided into 3 major groups. The first is the extracapsular arterial ring located at the base of the femoral neck. 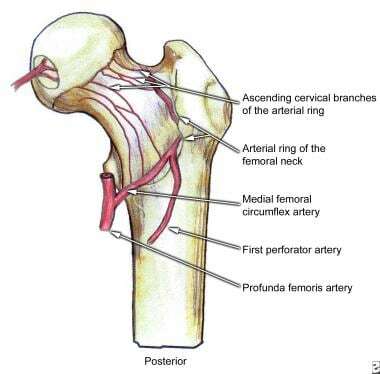 The second is the ascending cervical branches of the arterial ring on the surface of the femoral neck. The third is the arteries of the ligamentum teres. A large branch of the medial femoral circumflex artery forms the extracapsular arterial ring posteriorly and anteriorly by a branch from the lateral femoral circumflex artery (see images shown below). The ascending cervical branches ascend on the surface on the femoral neck anteriorly along the intertrochanteric line. Posteriorly, the cervical branches run under the synovial reflection toward the rim of the articular cartilage, which demarcates the femoral neck from its head. The lateral vessels are the most vulnerable to injury in femoral neck fractures. Posterior view of the extraosseous blood supply to the femoral head. Anterior view of the extraosseous blood supply to the femoral head. A second ring of vessels is formed as the ascending cervical vessels approach the articular margin of the femoral head. From this second ring of vessels, the epiphyseal arteries are formed. 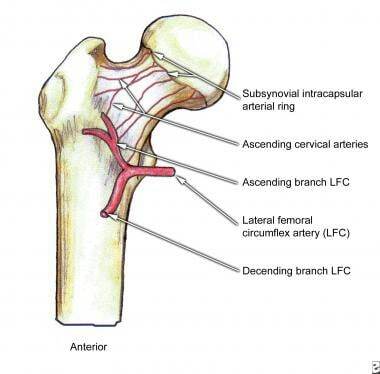 The lateral epiphyseal arterial group supplies the lateral weight-bearing portion of the femoral head. The epiphyseal vessels are joined by the inferior metaphyseal vessels and vessels from the ligamentum teres. Femoral neck fractures frequently disrupt the blood supply to the femoral head (see images below). The superior retinacular and lateral epiphyseal vessels are the most important sources of this blood supply. Widely displaced intracapsular hip fractures tear the synovium and the surrounding vessels. The progressive disruption of the blood supply can lead to serious clinical conditions and complications, including osteonecrosis and nonunion. Grade I is an incomplete or valgus impacted fracture. Grade II is a complete fracture without bone displacement. Grade III is a complete fracture with partial displacement of the fracture fragments. Grade IV is a complete fracture with total displacement of the fracture fragments. Frandersen et al concluded that clinically differentiating the 4 grades of fractures is difficult. Multiple observers were able to completely agree on the Garden classification in only 22% of the cases. Hence, classifying femoral neck fractures as nondisplaced (Garden grades I or II) or displaced (Garden grades III or IV) is more accurate. See the illustration depicted below. Femoral neck fractures are usually intracapsular. The femoral neck has essentially no periosteal layer; hence, all healing is endosteal in origin. The synovial fluid bathing the fracture may interfere with the healing process. Angiogenic-inhibiting factors in synovial fluid can inhibit fracture repair. These factors, along with the precarious blood supply to the femoral head, make healing unpredictable and nonunions fairly frequent. Bone is a dynamic tissue, which continually reacts to stressful events. According to data from Maitra and Johnson, stress fractures result from an imbalance between bone resorption and bone deposition during the host bone response to repeated stressful events. Most cortical stress involves tension or torsion; however, bone is weaker in tension and tends to fail by fracturing along a cement line. Maitra and Johnson went on to report that tension forces promote osteoclastic resorption, whereas compressive forces promote an osteoblastic response. With repeated stress, new bone formation cannot keep pace with bone resorption. This inability to keep up results in thinning and weakening of cortical bone, with propagation of cracks through cement lines, and, eventually, the development of microfractures. Without proper rest to correct this imbalance, these microfractures can progress to clinical fractures, the sine qua non of overuse. Devas, in 1965, classified stress fractures into 2 types that differ radiologically and have different clinical outcomes. The first is the tension stress fracture, which results in a transverse fracture directed perpendicular to the line of force transmitted in the femoral neck and originates at the superior surface of the femoral neck. This fracture pattern is at increased risk for displacement. These fractures carry a risk for further advancement of the fracture line superiorly and eventual displacement, leading to nonunion and avascular necrosis. Hence, early diagnosis and treatment are essential. The second type is a compression type of femoral neck stress fracture, which has evidence of internal callus formation on radiographic images. The fracture is usually located at the inferior margin of the femoral neck without cortical discontinuity. This fracture pattern is thought to be mechanically stable. The compression fracture occurs mostly in younger patients, and continued stress does not usually cause displacement. The earliest radiographic evidence of a compression stress fracture is usually a haze of internal callus in the inferior cortex of the femoral neck. Eventually, a small fracture line appears in this area, and it gradually scleroses. Fullerton and Snowdy described a femoral neck stress fracture classification with the following 3 categories  : (1) tension, (2) compression, and (3) displaced, as depicted below. Tension fractures occur on the superolateral aspect of femoral neck and are at high risk for displacement. Compression fractures are similar to those described by Devas, which occur on the inferomedial aspect of the femoral neck and have a low risk for displacement. Several theories have been developed to explain the mechanisms of femoral neck stress fractures and the biomechanics of the hip. Nordin and Frankel described the biomechanics of the hip. The load on the femoral neck can exceed 3-5 times the body weight when an individual is walking or running. Gravity acts on the center of the body mass, which results in torque on the medial aspect of the hip joint. This torque is counterbalanced by the contraction of the gluteus medius and minor. The total load on the femoral head is the sum of the forces producing these 2 torque forces. Then, these forces on the femoral head are transmitted through the femoral neck to the shaft, which create a significant amount of stress on the femoral neck as a result of compression and bending. Minimal tension or compressive strains have been confirmed to occur in the superior aspect of the femoral neck during a normal single-leg stance. When tension increases, the inferior aspect of the femoral neck takes over the burden of damping the forces of compression. When a patient bends forward, stress is induced on the superior aspect of the femoral head; however, counter traction of the abductor muscles also occurs. Hence, if the gluteus medius muscle is fatigued, the strain is placed entirely on the superior aspect of the femoral neck. This strain can predispose patients to femoral neck stress fractures. If the abductor muscles fatigue and are unable to provide normal tension, the tensile stress in the femoral neck increases. Muscle fatigue has been implicated as a contributing factor in the development of stress fractures. Muscle imbalance leads to changes in the application of stress across the femoral neck that may exceed the bone's capability to respond appropriately to stress. Muscle fatigue secondary to repetitive activity can decrease its shock-absorbing capacity so that higher peak stresses occur in the femoral neck. This can lead to gait abnormalities, which, in turn, can alter the body's center of gravity and change the patterns of stress placed on the femoral neck. In the 1960s, Frankel proposed that femoral neck fractures occur in the presence of a high ratio of axial load to bending load. Altered muscle balance may also increase the risk of a hip fracture. Another theory is that a fall onto the hip with a direct blow to the greater trochanter may generate an axial force along the neck, creating an impaction fracture. The combination of axial and rotational forces has also been proposed as a mechanism. The miserable malalignment syndrome combines femoral neck anteversion, genu valgum, increased Q-angle, tibia vera, and compensatory foot pronation that may not allow individuals to compensate for overuse. Leg-length discrepancy may also predispose individuals to injuries by creating an unequal distribution of stress and tension across the hip joint. Schnackenburg KE, Macdonald HM, Ferber R, Wiley JP, Boyd SK. Bone quality and muscle strength in female athletes with lower limb stress fractures. Med Sci Sports Exerc. 2011 Nov. 43(11):2110-9. [Medline]. Singh PJ, O'Donnell JM. The outcome of hip arthroscopy in Australian football league players: a review of 27 hips. Arthroscopy. 2010 Jun. 26(6):743-9. [Medline]. Konetsky M, Miller J, Tripp C. Femoral neck stress fracture. J Orthop Sports Phys Ther. 2013 Apr. 43(4):275. [Medline]. Plancher KD, Donshik JD. Femoral neck and ipsilateral neck and shaft fractures in the young adult. Orthop Clin North Am. 1997 Jul. 28(3):447-59. [Medline]. Brukner P. Sports medicine. The tired athlete. Aust Fam Physician. 1996 Aug. 25(8):1283-8. [Medline]. Lakstein D, Hendel D, Haimovich Y, Feldbrin Z. Changes in the pattern of fractures of the hip in patients 60 years of age and older between 2001 and 2010: A radiological review. Bone Joint J. 2013 Sep. 95-B(9):1250-4. [Medline]. Koval KJ, Zuckerman JD. Hip fractures: I. Overview and evaluation and treatment of femoral-neck fractures. J Am Acad Orthop Surg. 1994 May. 2(3):141-149. [Medline]. Joshi N, Pidemunt G, Carrera L, Navarro-Quilis A. Stress fracture of the femoral neck as a complication of total knee arthroplasty. J Arthroplasty. 2005 Apr. 20(3):392-5. [Medline]. Volpin G, Hoerer D, Groisman G, Zaltzman S, Stein H. Stress fractures of the femoral neck following strenuous activity. J Orthop Trauma. 1990. 4(4):394-8. [Medline]. Zahger D, Abramovitz A, Zelikovsky L, Israel O, Israel P. Stress fractures in female soldiers: an epidemiological investigation of an outbreak. Mil Med. 1988 Sep. 153(9):448-50. [Medline]. Devas MB. Stress fractures of the femoral neck. J Bone Joint Surg Br. 1965 Nov. 47(4):728-38. [Medline]. [Full Text]. Fullerton LR Jr, Snowdy HA. Femoral neck stress fractures. Am J Sports Med. 1988 Jul-Aug. 16(4):365-77. [Medline]. Monteleone GP Jr. Stress fractures in the athlete. Orthop Clin North Am. 1995 Jul. 26(3):423-32. [Medline]. Holder LE, Schwarz C, Wernicke PG, Michael RH. Radionuclide bone imaging in the early detection of fractures of the proximal femur (hip): multifactorial analysis. Radiology. 1990 Feb. 174(2):509-15. [Medline]. [Full Text]. Quinn SF, McCarthy JL. Prospective evaluation of patients with suspected hip fracture and indeterminate radiographs: use of T1-weighted MR images. Radiology. 1993 May. 187(2):469-71. [Medline]. [Full Text]. Blomfeldt R, Tornkvist H, Ponzer S, Soderqvist A, Tidermark J. Internal fixation versus hemiarthroplasty for displaced fractures of the femoral neck in elderly patients with severe cognitive impairment. J Bone Joint Surg Br. 2005 Apr. 87(4):523-9. [Medline]. Stappaerts KH. Early fixation failure in displaced femoral neck fractures. Arch Orthop Trauma Surg. 1985. 104(5):314-8. [Medline]. Scheck M. The significance of posterior comminution in femoral neck fractures. Clin Orthop Relat Res. 1980 Oct. 152:138-42. [Medline]. Heetveld MJ, Raaymakers EL, van Eck-Smit BL, van Walsum AD, Luitse JS. Internal fixation for displaced fractures of the femoral neck. Does bone density affect clinical outcome?. J Bone Joint Surg Br. 2005 Mar. 87(3):367-73. [Medline]. Moroni A, Hoque M, Waddell JP, Russell TA, Wippermann B, Digiovanni G. Surgical treatment and management of hip fracture patients. Arch Orthop Trauma Surg. 2011 Dec 6. [Medline]. Wang F, Zhang H, Zhang Z, Ma C, Feng X. Comparison of bipolar hemiarthroplasty and total hip arthroplasty for displaced femoral neck fractures in the healthy elderly: a meta-analysis. BMC Musculoskelet Disord. 2015 Aug 28. 16:229. [Medline]. Nattiv A, Kennedy G, Barrack MT, Abdelkerim A, Goolsby MA, Arends JC, et al. Correlation of MRI grading of bone stress injuries with clinical risk factors and return to play: a 5-year prospective study in collegiate track and field athletes. Am J Sports Med. 2013 Aug. 41(8):1930-41. [Medline]. Arnold WD. The effect of early weight-bearing on the stability of femoral neck fractures treated with Knowles pins. J Bone Joint Surg Am. 1984 Jul. 66(6):847-52. [Medline]. [Full Text]. Askin SR, Bryan RS. Femoral neck fractures in young adults. Clin Orthop Relat Res. 1976 Jan-Feb. 114:259-64. [Medline]. Barnes R, Brown JT, Garden RS, Nicoll EA. 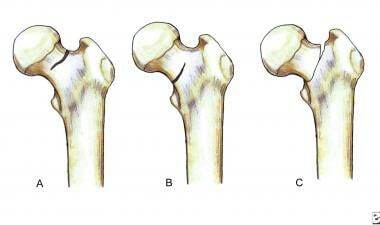 Subcapital fractures of the femur. A prospective review. J Bone Joint Surg Br. 1976 Feb. 58(1):2-24. [Medline]. [Full Text]. Blickenstaff LD, Morris JM. Fatigue fracture of the femoral neck. J Bone Joint Surg Am. 1966 Sep. 48(6):1031-47. [Medline]. [Full Text]. Blomfeldt R, Tornkvist H, Ponzer S, Soderqvist A, Tidermark J. Comparison of internal fixation with total hip replacement for displaced femoral neck fractures. Randomized, controlled trial performed at four years. J Bone Joint Surg Am. 2005 Aug. 87(8):1680-8. [Medline]. Bray TJ, Smith-Hoefer E, Hooper A, Timmerman L. The displaced femoral neck fracture. Internal fixation versus bipolar endoprosthesis. Results of a prospective, randomized comparison. Clin Orthop Relat Res. 1988 May. 230:127-40. [Medline]. Delamarter R, Moreland JR. Treatment of acute femoral neck fractures with total hip arthroplasty. Clin Orthop Relat Res. 1987 May. 218:68-74. [Medline]. Egol KA, Dolan R, Koval KJ. Functional outcome of surgery for fractures of the ankle. A prospective, randomised comparison of management in a cast or a functional brace. J Bone Joint Surg Br. 2000 Mar. 82(2):246-9. [Medline]. [Full Text]. Fairclough J, Colhoun E, Johnston D, Williams LA. Bone scanning for suspected hip fractures. A prospective study in elderly patients. J Bone Joint Surg Br. 1987 Mar. 69(2):251-3. [Medline]. [Full Text]. Figved W, Opland V, Frihagen F, et al. Cemented versus uncemented hemiarthroplasty for displaced femoral neck fractures. Clin Orthop Relat Res. 2009 Jan 7. epub ahead of print. [Medline]. Garden RS. The significance of good reduction in medial fractures of the femoral neck. Proc R Soc Med. 1970 Nov. 63(11 pt 1):1122. [Medline]. [Full Text]. Haidukewych GJ, Rothwell WS, Jacofsky DJ, Torchia ME, Berry DJ. Operative treatment of femoral neck fractures in patients between the ages of fifteen and fifty years. J Bone Joint Surg Am. 2004 Aug. 86-A(8):1711-6. [Medline]. Karanicolas PJ, Bhandari M, Walter SD, Heels-Ansdell D, Guyatt GH. Radiographs of hip fractures were digitally altered to mask surgeons to the type of implant without compromising the reliability of quality ratings or making the rating process more difficult. J Clin Epidemiol. 2009 Feb. 62(2):214-223.e1. [Medline]. Koval KJ, Skovron ML, Aharonoff GB, Zuckerman JD. Predictors of functional recovery after hip fracture in the elderly. Clin Orthop Relat Res. 1998 Mar. 348:22-8. [Medline]. Magu NK, Rohilla R, Singh R, Tater R. Modified Pauwels' intertrochanteric osteotomy in neglected femoral neck fracture. Clin Orthop Relat Res. 2009 Jan 14. epub ahead of print. [Medline].